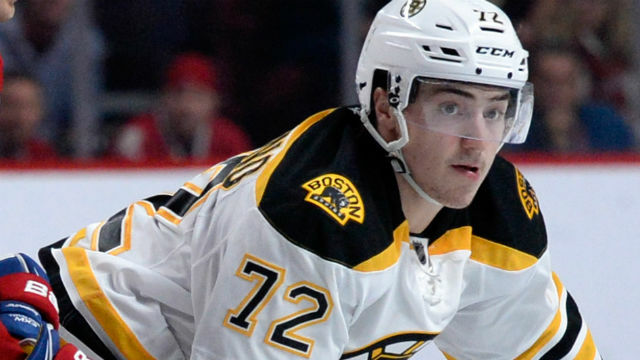 After recalling Frank Vatrano on an emergency basis last week and then sending him back to Providence without giving him any ice time, the Bruins have called the 22-year-old back up to the big leagues. Vatrano has appeared in a total of 30 games for Boston this year, scoring six goals and tallying one assist. The Bruins have also recalled goaltender Jeremy Smith on an emergency basis. Smith has yet to make his NHL debut and has only played 11 games for Providence this year. He has a 7-3-1 record, 2.07 goals against average, and .932 save percentage. He played for the P-Bruins last season, but was loaned to the Minnesota Wild’s AHL affiliate in Iowa to begin the 2015-16 campaign. He rejoined the Providence last month after Malcolm Subban suffered a fractured larynx. Both Vatrano and Smith participated in practice for the B’s on Tuesday. Previous Boston Bruins: Time To Save Money For A Panic Button Or Playoff Tickets?